On 9th September 2013 celestial event of “Moon in conjunction with Venus” will occur. i.e. 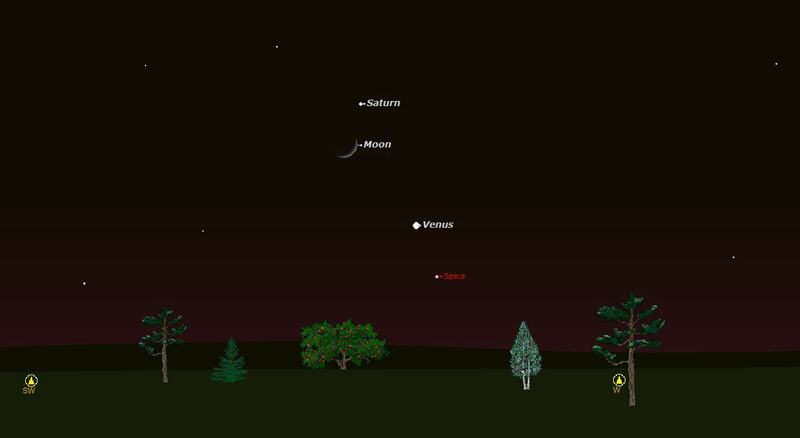 both Venus and Moon will appear as pair near to each other in the sky. Astronomically speaking Venus& Moon can be said to be in Conjunction at 2.16 a.m. IST on 9th Sept. As Venus sets by 8.30pm people can start noticing the pairing on 8th Sept itself after Sunset. Further on 9th September 2013 at 9.17pm IST Celestial event of “Moon in conjunction with Saturn” where in Saturn and Moon will appear near to each other in the west side sky. Note: Moon our celestial neighbor and Planets are located at greater distance from earth and they themselves are separated by enormous distance. However due to conjunction they appear near to each other in our skies. During the course of next few days as observed by observer from Earth starting 8th Sept one can notice the increasing distance between Moon, Venus or Moon getting close to Saturn and getting away far as Moon continues its monthly journey around earth. 1.About Venus & Moon – 8th Sept (above Moon), 9th Sept (below Moon) - West: appearing like a non-twinkling bright object these days Venus is visible from Sunset onwards and Sets by 8.30 pm. Hence one can best appreciate celestial pairing from 8th Sept onwards i.e. Venus will appear above crescent moon on 8th Sept whereas Venus will appear below crescent Moon on 9th September from Sunset to 8.30pm. 2. About Saturn & Moon – 9th Sept (above Moon), 10th Sept (far below Moon on right) - West: Saturn will appear above Moon on 9th Sept whereas on 10th Sept it will appear far below Moon towards right side. Saturn will appear like non-twinkling Star like object. 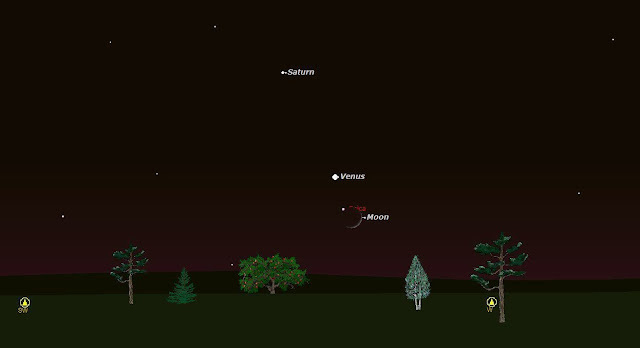 Public can appreciate this celestial event from Sunset to 9pm as Saturn sets by 9.15 pm.